Infiniti Yachts Ltd congratulates Bob Oatley’s Wild Oats XI team for its record-levelling seventh line honours victory in the 2013 Rolex Sydney Hobart. Infiniti Yachts has the revolutionary Dynamic Stability System (DSS) at the core of its design and as such provides unparalleled performance and comfort. Part of the Australian 100 footer’s success in this year’s race can be directly attributed to the DSS foil fitted to Wild Oats XI this season. Some 10 years in development, the patent-protected DSS foil runs laterally across the boat and when required can be deployed to leeward beneath the waterline. The vertical lift this provides, which increases with the speed of the yacht, dramatically improves righting moment, an effect similar to having many more crew on the weather rail. This in turn translates into the boat having more power, less drag and therefore improved performance. 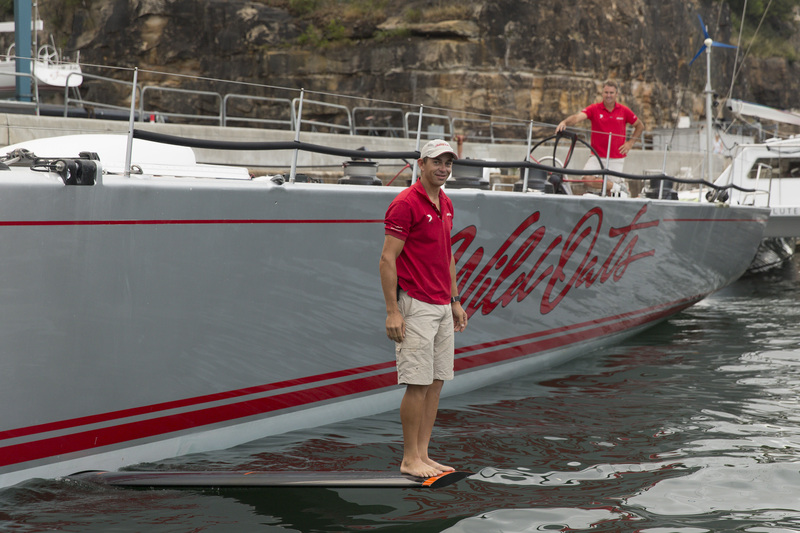 On Wild Oats XI, the DSS foil protrudes from the leeward side of the hull by just over 2m and the foil provides eight to ten tonnes of vertical lift. The added righting moment the foil provided in the Rolex Sydney Hobart was also vital in enabling Wild Oats XI, with her narrow beam of 5.2m, to compete with the newer and more powerful Perpetual LOYAL, which has a beam of 7.4m, in bigger conditions and points of sail when righting moment was a key factor. Arriving in Hobart, tactician Iain Murray attributed a 5% gain in Wild Oats XI’s speed to the DSS foil, which had been put to good work as the wind built to more than 30 knots coming down the east coast of Tasmania and continued to build as they hardened up to cross the aptly named Storm Bay. In fact according to the DSS’s creator British yacht designer Hugh Welbourn, Wild Oats XI’s retro-fitted foil can be considered a ‘DSS-lite’, and therefore only achieves a relatively small percentage increase in performance compared to what would be expected with from an Infiniti yacht where the DSS foil is integral to the original design. It has a smaller area and is shorter than would normally be fitted to a 100ft maxi. It is also straight, whereas DSS foils normally have some curvature to them that raises the tip of the foil when it is deployed, creating yet more lift. Wild Oats XI is the one of the latest to be fitted with a DSS foil, however Infiniti Yachts have several Welbourn designs that have been created specifically to harness the potential of the foil. Rather than gaining righting moment from traditional features such as keel bulb weight or draft or waterline beam, the Infiniti Yachts are typically lighter and more slender than many other designs, deriving a greater portion of their righting moment from the DSS foil. This is a highly potent combination providing blistering pace off the wind in anything above light to moderate conditions and a fine, low drag hull in light conditions when the DSS foil is simply retracted into the hull. Upwind the DSS foil produces less righting moment but decreases pitching and heeling, resulting in better performance and more comfort. The Infiniti 100R for example weighs just over 20 tonnes making her the world’s lightest 100ft offshore racing monohull, capable of covering more than 700 miles/day. All the Infiniti Yacht designs benefit from DSS and its significant improvement in performance and comfort. “It is great to see Wild Oats XI perform so well and this gives us even greater confidence that the Infiniti 100R, which is lighter and has much more optimised DSS foils, will perform as we expect and will deliver our clients something truly spectacular and unique,” said Infiniti Yachts’ Gordon Kay.